Whatever the pest, Arilon has your back. More advanced chemistry, now even more flexible. Outstanding performance against a wide variety of ants, cockroaches and houseflies. 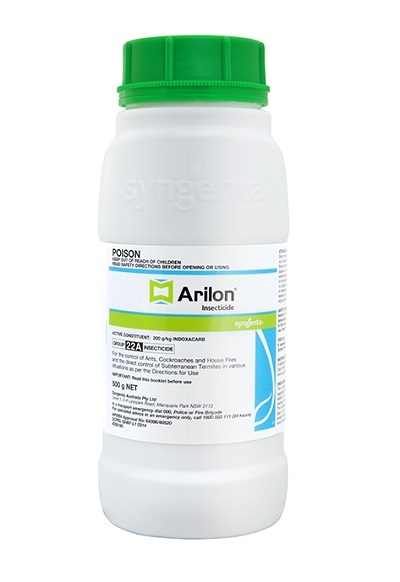 ARILON is the nonrepellent insecticide to always have on hand. On top of being extremely effective, it’s one of the most versatile solutions on the market – use it against ants, cockroaches, houseflies and termites; indoors or outdoors; and on different surfaces. Partner with ADVION Ant or ADVION Cockroach baits to pack a punch. ARILON’s powerful activity, combined with its non-repellent properties, offers effective control against a wide range of pests. A termite’s nest temperature rapidly drops after applying ARILON, signifying colony collapse. Partner ARILON Insecticide with ADVION gels in situations where superior cockroach or ant control is needed, such as in commercial kitchens, warehouses and areas with persistent infestations. Applying ADVION over the top of ARILON not only improves uptake of the active ingredient; it also speeds up control and delivers a broader, longer-lasting treatment zone compared to using ARILON alone. This pairing can also deliver results in jobs that have previously been resistant to other treatments. Registered for remedial termite control, including Mastotermes spp.